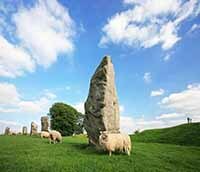 Avebury - A World Heritage Site and a Scheduled Ancient Monument. Those prehistoric standing stones are just as important but less famous than their neighbour Stonehenge. Neolithic in origin it contains the largest stone circle in Europe, yes much bigger and older than Stonehenge, and was erected more than two and half thousand years BC. One can only wonder at the skills of those old timers who constructed the site, all with handraulics!!! 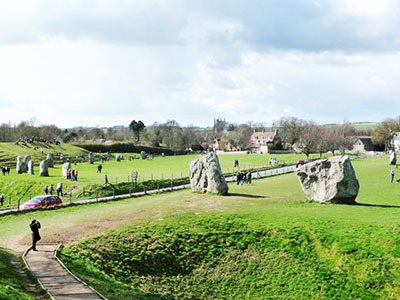 The site is still in habitation, the village of Avebury lies around and within this monument. That means for a staggering four and half thousand years and more, perhaps even six thousand years, people have lived in this locality, although the village itself did not appear until the Saxons built it. Certainly the Romans before them liked the spot. It is all part of a massive area around that in prehistoric times must have been extremely important for with not only Stonehenge but places like Marden, Silbury Hill, West Kennet Long Barrow, the Sanctuary etc it all speaks of incredible organisation with a not too large a population compared with today. Wiltshire is fortunate in its prehistory in so many ways. There is some suggestion that the site pre dated the Neolithic and goes back into the Mesolithic, but this has never been proved. Probably there were people around there, the Mesolithic's were a semi nomadic culture, rather the beginning of settlement. So it is likely their settled culture, stone loving, Neolithic descendants just continued to live there. The site has a diameter of 1380ft or 420 metres. 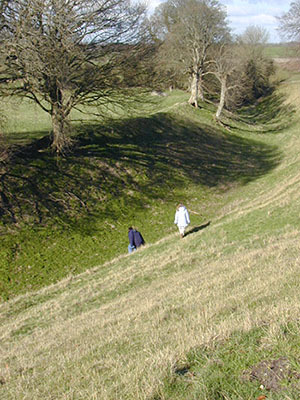 The ditch is 69ft or 21 metres wide and 36ft or 11 metres deep. It is likely it would not have been constructed all in go, probably would have been updated throughout its life. The very large outer circle of stones has a diameter of 1088ft or 331.6 metres which must have taken a very long time to build by handraulics like the henge. Whether or not it was built in the same timeframe as the henge is an ongoing debate, it may have been later. The inner circles of stones are a lot smaller and there are two of them. The northern one is 322ft or 98 metres in diameter and the southern one 354ft or 108 metres in diameter. There has always been wonder at how those ancient folk moved those stones. The large circle originally had 98 sarsen standing stones and they were pretty heavy and can be as much as 40 tons in weight! They ranged in height between around 11ft to over 14ft!!!! Sarsen stones can be found all over this part of England. They are a dense hard rock and pretty durable as these monuments testify. The northernmost circle now has only two of its four standing stones upright and there are three smaller ones in the middle. The southern circle was destroyed and now lies beneath the part of the village that was built in the 1700's. It is said to have been an 18ft high monolith with smaller stones around. There is a third part to this amazing site that is thought to have controlled access to the whole landscape of sites by its original peoples. The West Kennet Avenue as as it is called now is an avenue of parallel stones 25 metres wide and 2.5kms long. It ran between Avebury and another Neolithic site, The Sanctuary. It is still the best way to approach the site. The site's purpose is not really known, it may have been religious and is also probably connected with funerals. That it was very important to those people is obvious with so many such monuments from the Orkneys to the south of the country and into Europe. With the Iron Age which followed the Neolithic perhaps a thousand years later, this type of site was no longer being used, this was a new culture with new ideas. Although the population of the area goes back millennia the actual village of Avebury did not commence until Saxon times and was originally built to the west of the present village. Prior to the Domesday Book it was called Kennet. The name is retained by the River Kennet. During medieval times, at the beginning of the 1100's, it was connected with another religion a small Roman Catholic Priory, Avebury Priory. Later the pretty Avebury Church and its estate went to Cirencester Abbey. Like all places of habitation they tend to grow as the population increases and so it was with Avebury. During the 1700's it moved into the area of the Monument and of course then it was not really realised just how important that site was. Like all places available stone could be recycled, but it was found that these stones although durable were not good building material. Probably saved the rest of the site!!! During the 1900's when it was actually realised how important the monument was, quite a lot of the buildings within it were removed and the inhabitants relocated to the neighbouring village of Avebury Truslow. The work was not completed because of the outbreak of World War II so there are still buildings within the circle. What would it be like to live within that circle? Ghosts, mysterious happenings??? Or do the ghosts and spirits of the Neolithic people enjoy the company of the modern world? The Red Lion pub is a pleasant chocolate box building around 400 years old. It is listed in the Top Ten most haunted pubs, but its ghost is not Neolithic, she is Florrie, killed by her husband in far more modern times! A walk round the village is a pleasant occupation. Certainly do not forget your camera, there are so many images of the monument and the village that just ask!!!!! The attractive St James Church is quite close to the monument. Built at the end of the Saxon era and continued under Norman times. The tower is from the 1400's with further work during Victorian times. The Friends of The Ridgeway have opened a new long distance walk, The Great Stones Way, around thirty six miles between Avebury and Stonehenge with shorter circular walks for the not so active. Will prove quite an attraction in the area. If you would like to return to your previous page, please click the back button. Alternatively you might like to browse some more, if so please click one of the navigation buttons on the left. 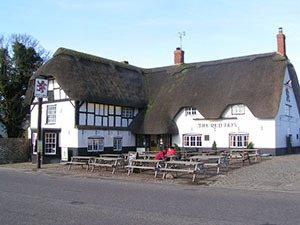 The site is owned by The National Trust and run by English Heritage. If you are just visiting Avebury. or are having a pleasant break in the area there is plenty of accommodation around. Hotels can be found here. Or you might want a cosy self catering cottage. There are some lovely ones in Wiltshire.